The crossover SUV trend really took off when drivers realized that they could get a stylish, capable, and spacious vehicle without sacrificing efficiency, and no model is better at combining those than the Toyota RAV4. Well, those qualities remain key components of the 2019 RAV4, but a complete redesign brings even more to the Toyota SUV, which is sure to shake up the crossover class yet again. If you want to see what it is that makes the 2019 Toyota RAV4 an exceptional option, read on! Many car shoppers around Dallas have been coming to our Toyota dealership for years as better deals on amazing vehicles in the area are hard to find. Well, while those offers and other terrific services for car shoppers won’t disappear, we are changing from Atkinson Toyota South Dallas to just South Toyota. If you don't know about us and what makes us a popular car dealer for Dallas drivers, be sure to read all the info below on the various reasons to come to our dealership with a new name! We here at Atkinson Toyota South Dallas understand the importance of making the right choice with your next new car. You can rely on us to be knowledgeable enough to help you find the features and design you come to expect. When you walk up to the 2018 Highlander, you’ll first notice its distinctive front grille. Combined with the dynamic headlights, you get a bold look that sets apart this popular midsize SUV. The Toyota Entune App is an in-dash smart feature that is offered with the 2018 Camry, the 2018 Sienna, the 2018 Mirai, and the 2019 Avalon. You can read our content below to find our more about the Toyota Entune App. The Entune App provides you with Bluetooth connectivity. You can pair your smartphone with the app to stream music and make hands-free calls. The Entune App also comes with SiriusXM Satellite Radio that lets you listen to music, news, sports, and entertainment without any commercials. The demand for hybrid vehicles is on the rise, which is why Toyota offers the RAV4 hybrid. This vehicle is a top choice among consumers because it comes with a variety of innovative performance features. 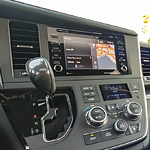 If you want to learn more about the 2018 Toyota RAV4 interior features, read our summary below. With the 2018 Toyota RAV4, you can take advantage of the available HomeLink System. This system allows you to control the front gate, garage door, and security system of your home. Truck owners just want their truck to always get the job done, no questions asked. They need something that works hard for them and looks great while doing it. That is why all of our truck experts here at Atkinson Toyota South Dallas are so excited about the arrival of the new Toyota Tundra. This truck includes Light Emitting Diode (LED) headlights which give off an unmistakable light an last far longer than more traditional headlights. Additionally, the Tundra features a gray grille with chrome surroundings that give it a great aesthetic look that many other trucks are lacking. If you're on the hunt for a car that has unique exterior style, take a look at the 2018 Toyota Camry. This popular mid-sized sedan boasts detailed features that make it stand out on the road. On the front end of the car is an aggressive front grille. It has a distinct angular shape that complements the rest of the sedan's aggressive build. As of the most popular mid-size SUVs, the Toyota 4Runner offers power, style, and a great driving experience. However, did you know that that it's also got some great capability features? Here are the top two. The Toyota 4Runner comes with a four-mode Multi-Terrain Select function, helping you to get the best possible traction and wheelspin across a wide variety of terrain by adjusting the engine throttle. The Toyota Prius really captures attention. Even when simply parked, the Prius draws people's eyes. If you think the looks impress, wait until you get behind the wheel. Performance-wise, the Prius has much to offer. Driving a Prius becomes an unforgettable experience. The Prius reflects Toyota's investment in the hybrid electric car market. Anyone hoping to cut down on fuel costs and leave less of a carbon footprint might find the Prius to be worth considering. The 2018 Toyota RAV4 is in line to make a different type of impact on its vehicle class. It is designed to handle the off-road. However, the RAV4 sports a luxurious interior that provides drivers and passengers with an elegant experience while traveling on various terrains. The vehicle is supported with metallic badge door-sill protectors that add to comfort and seating.